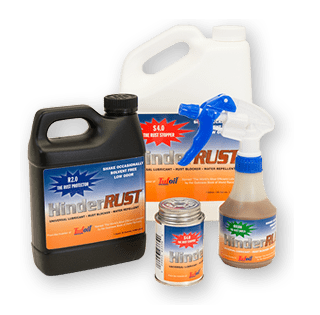 HinderRUST is a rust stopper engineered with Tufoil Technology, a proprietary PTFE technology that is solvent-free, non-flammable, and won’t evaporate away. The Tufoil in HinderRUST acts as a lubricant and wetting agent that spreads HinderRUST across the treated surface, displacing water and enabling it to bond to the surface and protect it from corrosion. HinderRUST provides surface film management by creating a thin film of anti-corrosion properties to serve as a barrier against salt and water. Why should you choose HinderRUST over the other rust inhibitors on the market? When you compare HinderRUST to the competition, the choice is obvious. Here are just a few things that make us the #1 rust inhibitor. Solvent Free! Almost every other rust stopper on the market uses highly flammable solvents. Prevents rust more completely than other rust preventers. Lasts longer than other inhibitors, less need for reapplication. HinderRUST S4.0 and HV-100 are the first rust inhibitors to pass all weld through tests at the Welder Testing and Training Institute. HinderRUST is a lubricant as well as a rust stopper. It uses award-winning Tufoil Technology and is backed by over 50 years of research. Three versions of HinderRUST ensures the right product for every need. No matter what type of protection you need, we have a version perfect for you. We applied your product to a heavily rusted folding machine feed roller chain. The chain had been stiffened by rust for over a year, rendering the machine inoperable. HinderRUST dissolved the rust, lubricated the chain and returned it to a usable state. Today, our first customer for HinderRUST is a shop repairing Rolls Royces for royalty and nobility. This old customer of ours usually has about a dozen Rolls awaiting repairs in his shop. Please let Mr. Reick know that Tufoil and now HinderRUST are proudly used on such cars meant for monarchy here. HinderRUST soaks right into our wire rope, protecting the entire cable.